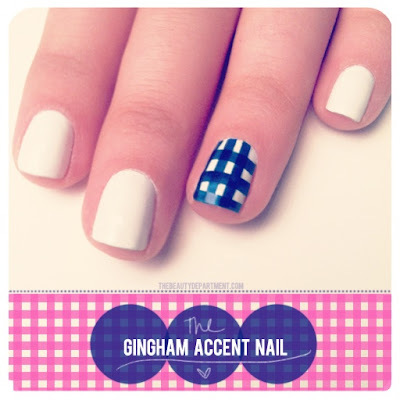 One of my all time favorite blogs, The Beauty Department, recently showed off a great manicure idea. They created this great mani using clear tape! I'm crazy about gingham print so I thought I'd give it a whirl. I gathered my supplies and sat down in front of the television. I knew this would be time consuming. I decided my accent color would be hot pink so I started by painting the pink on the clear tape. I have a really crummy, off brand roll of tap which made me really nervous about the whole activity. I taped the painted sections to the edge of a wooden boat we keep on our coffee table to dry. I made plenty assuming I would make mistakes. While the pink tape dried, I painted a base white on both hands. Please don't judge the polish outside of the nail. I grabbed small, sharp scissors and some tweezer in preparation for cutting tiny little stripes. The first cut doesn't go so well, but I improved as the night wore on. I used the tweezers to place each small strip. I'm not fully committed to this look yet, so I decided to give it a try on the other hand. I am a little happier with this hand, but it doesn't look half as cute as the girls from The Beauty Department. I gave the original guy a re-do. When I pulled off the tape I discovered it hacked up the base polish. I had to re-do that as well. I went with smaller, thinner strips for this hand. i didn't like it either! I did it again, with thicker strips. Does this even look like gingham? I think I chose the wrong color. I might bust this mani out again around Independence Day. What do you think?